Multi-function: it is suitable for the shaping of high grade cattle boots, horse boots, canvas shoes and sports shoes of men and women. Cold mold sweep knife structure, cooling stereotypes when the upper of the outer edge of the inner fold, cheaper than the end. The fixed way of sweep knife is firm, and the effect is perfect. Pressure is controlled by air pressure. And adjustable. The position of each clamping claw can be adjusted according to the radian of aluminum mold, the pulling Angle of clamping claw can be adjusted according to the height of heel, and each fixture can be adjusted to various angles, which is convenient and quick. Make the shoemaking work more perfect. Precision projection cross lights ensure accurate placement. The cold and hot molds can be replaced quickly and can be customized according to the size of the customer's shoe last. Adopt imported temperature controller, temperature digital control. 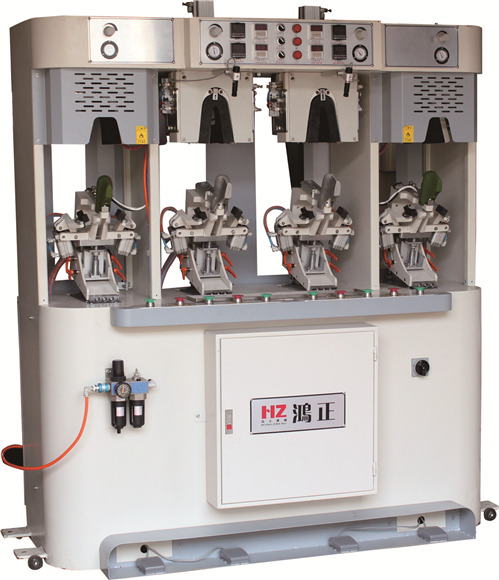 The operation of the machine is simple and straightforward.